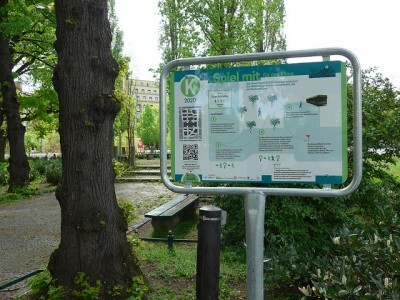 K2020.berlin is a street and mobile game package about climate protection related measures in the city commissioned by Climate-KIC Berlin, developed in cooperation with Berlin Metropolitan Utilities Dialogue. K2020 is a combination of five physical site-specific street games and a browser based narrative game. Five permanently installed street signs display rules for standalone games about climate related principles in the neighborhood. At the same time the signs function as stations for the mobile game that tells a longer interactive agent story about climate protection related measures of Berlin utility providers.